Given the hype surrounding the opening of LocoL, the alternative fast food restaurant from Roy Choi and Daniel Patterson, I expected there to be a line around the block. In fact, when I showed up at the Broadway Street location in Oakland around 5:30 p.m. on opening day, Wednesday, May 25, I thought for a second that the "special event" parking rate in the garage on the corner was for the opening of the small restaurant. 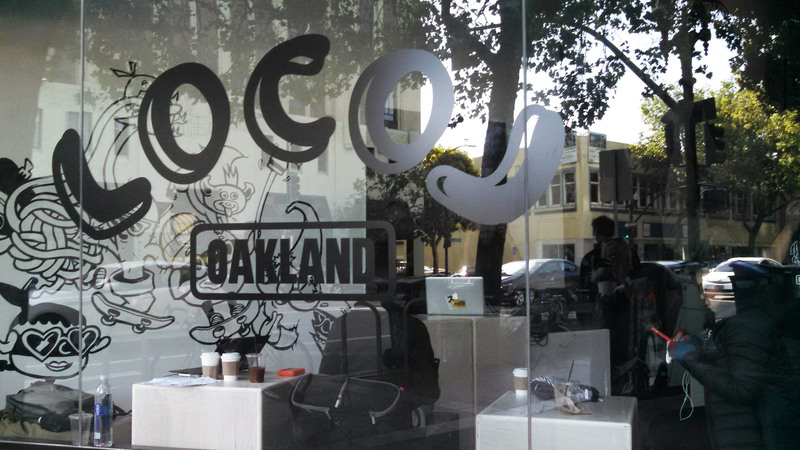 LocoL is the second location for Choi and Patterson. The first opened in Watts about four months ago. The Bay Area spot was originally planned for the Tenderloin, but delays have pushed that opening back. Instead Choi, known for his Kogi BBQ trucks, and Patterson, who owns restaurants Alta, Coi, and Plum Bar (around the corner), decided to bring their model of local, healthy, affordable food to the neighborhood around Broadway and Grand in Oakland. The idea, which raised $129,000 on IndieGoGo, is to bring relatively healthy and very tasty fast food to what were previously food deserts, where locals will be employed to run the kitchens and drive the menus. In the space formerly occupied by Plum, around the corner from the still open Plum Bar, this location isn't in exactly a food desert. But it's still tasty, cheap, and community-driven, and more locations are planned for West Oakland and that delayed Tenderloin project. 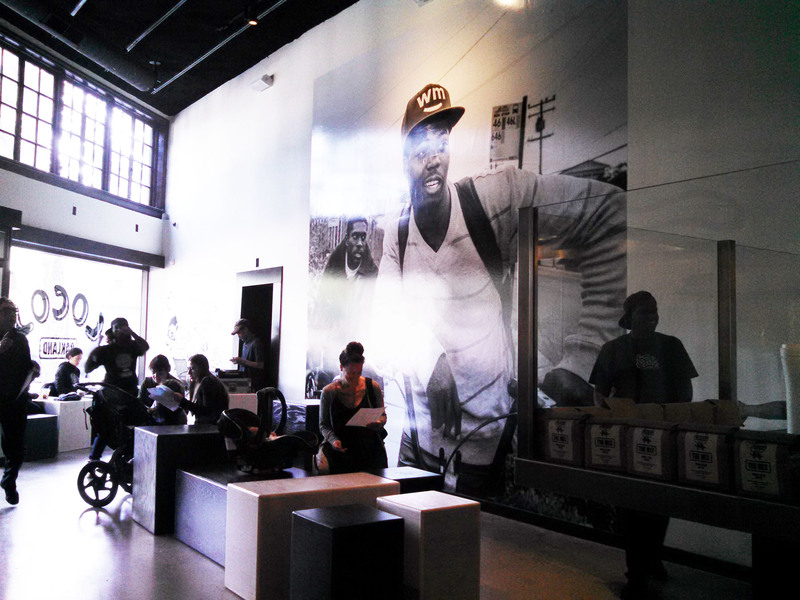 The Oakland space is medium-sized, with about 25 people fitting comfortably when I was there. It felt bustling, loud, and busy, but not overwhelmingly so. While there was a DJ blasting music in the corner, I'm guessing he was primarily there for the opening. There is a small open kitchen, with orders handed over the counter on trays. In between the signature murals on the walls, the floor is filled with wooden boxes, designed to be moved around -- which a group of kids was having fun doing over and over -- and used as tables or chairs. There are also a handful of seats and a counter outside in the small square. 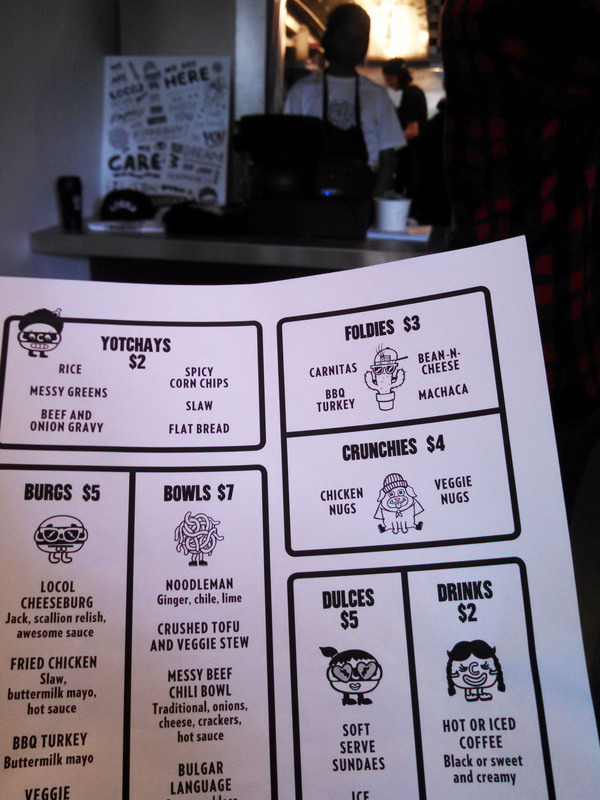 I was handed a menu as soon as I walked through door, which consists of what they're calling "burgs" and "bowls" -- variations on burgers and rice or noodle bowls, all in the $5-7 range. There are also "foldies" and "crunchies," ie. quesadilla-type things and nuggets, as well as $2 sides (known as "yotchays") like flat breads, corn chips, and slaw. Different kinds of breakfast sandwiches, yogurt and granola, and French toast holes (which sound amazing) are $3-5. 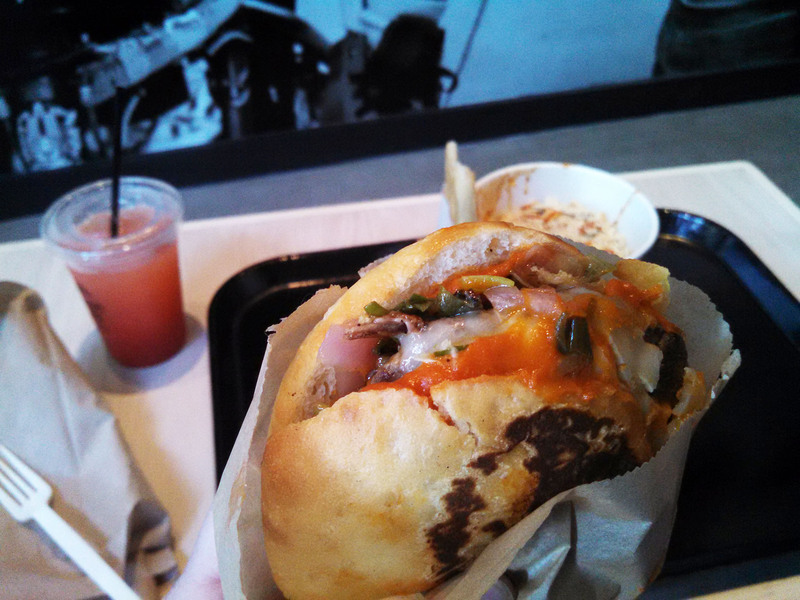 I ordered the Locol Cheesburg, which comes with jack cheese, scallion relish, and "awesome sauce." Since I don't love relish, I almost asked for it without, but that would have been a mistake. The combination was delicious. I had expected something more along the lines of the local high-end burger shacks, like Weezy's or Super Duper, but this was something else entirely, with lots of different flavors mixing together. Even the buns were unique, denser than traditional hamburger buns -- which shouldn't come as surprise, since Chad Robertson of Tartine helped them develop the recipe for the bread. It was only later that I put together exactly what it was the burger tasted like to me. Down in L.A., I used to go to Choi's Alibi Room restaurant for Korean burritos that always had unexpected, but amazing, flavor combinations. This burg was distinctly from the same chef. Searching for something that resembled fries -- which aren't an option on this one-of-a-kind fast food menu -- I also ordered the side of flatbread. It ended up being my favorite thing of the night. Light and fluffy, but slightly sweet, it could have passed for a healthier dessert. I topped all that off with a strawberry-lime agua fresca, because I have a soft spot for really good agua fresca. The only problem was it was gone way too quickly -- the one thing that wasn't completely filling. 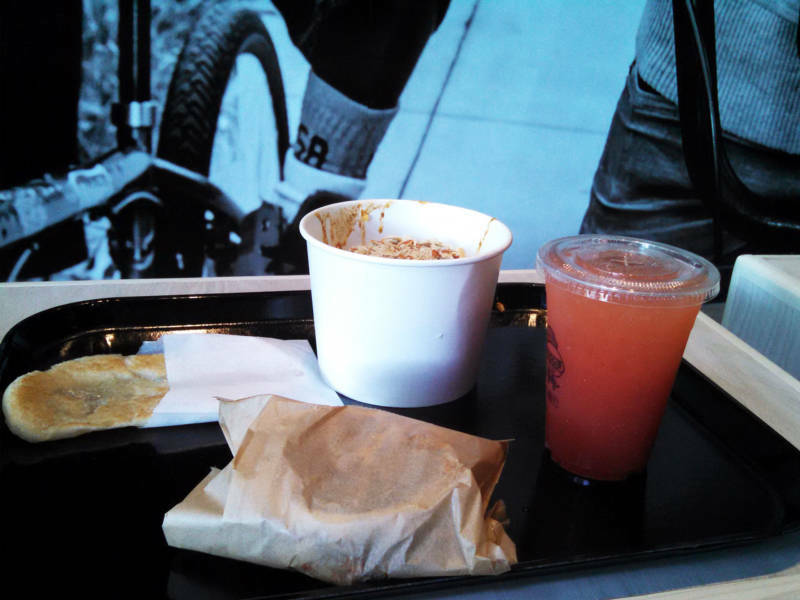 Wanting to explore the whole menu, I also tried the messy chili bowl. 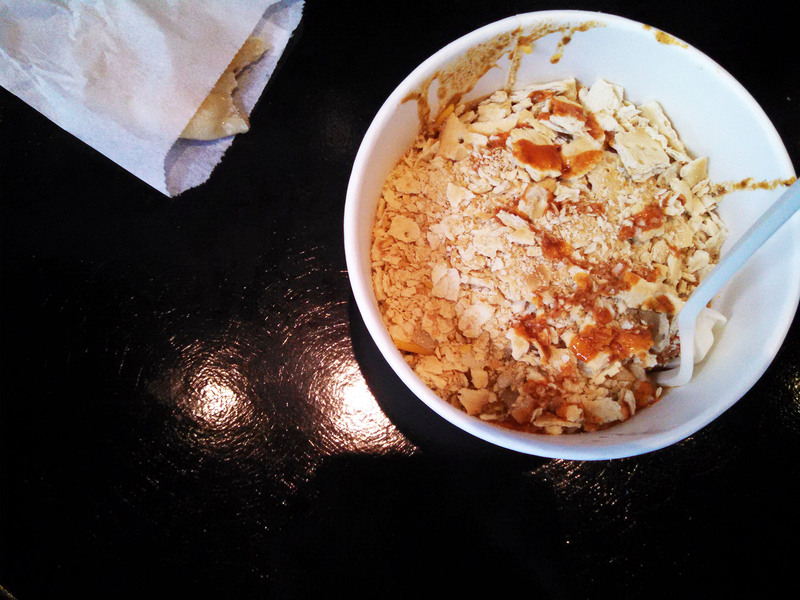 It's a multi-layered bowl, coming covered in a topping of crackers and cheese and a dabble of spicy sauce, so that you can't even seen what might be beneath. But once you start digging in, there's meat, beans, and at the bottom a layer of rice, which was an unexpected but welcome surprise. Since I couldn't finish the bowl, I grabbed a lid from the shelf of utensils and napkins, took it home, and heated it back up for a late-night snack. And all that cost me less than $20.